For those of you that have owned this buggy for a while, please enlighten me as to why no one and I mean NO ONE has the buggy in stock and very little parts available. How to you guys and girls get by when you can't even buy wheels? I have heard good things about this buggy, watched it run, and would like to buy one. But when I started to look I found out you cant get them. I would really like to know how a company expects to survive when they can't even provide parts for the cars they sell? I know that the first batch of cars sold out, etc. But how long does it take to make another batch? How long have you guys been waiting for parts and how do you get by in the meantime? Has anyone contacted Durango about this issue? I emailed them but did not get a response. I am ready to buy the 210, 410, and parts. Very frustrating, and poor management on their part. Sorry for the rant. We all understand your frustration. Like every other high demand new product there is is a world market for it. Just as many guys bought kits in the UK as here in the states. It take lots of parts to make lots of kits so finding parts will be a little tough for a few weeks. But only because the buggy was just released. This is no different that any other manufacture. When Losi released the 22 it was kits first followedweeks later by parts. There were guys at my track with broken cars that couldn't race for a few weeks. When AE released the SC10 4x4 there were no parts anywhere. It look over another a month to get springs and sway bars. This such a high demand kit that Durango is trying to keep up.....with everyine in the world that wants one. MY lhs ordered 12 and got shipped 7....all 7 were spoken for before they were even shipped. Everyone on this thread would like to have spares in their pit....and when the parts get released we will. But until then we race on hoping not to break. I don't run for Durango, but I can assure you this car is well worth waiting for! Last edited by Ray Kindstrom; 11-03-2011 at 04:55 AM. The FedEx website says my buggy will be in today! Great thread so far! Lots of good info. What setup are most of you guys running for a medium traction indoor clay track? 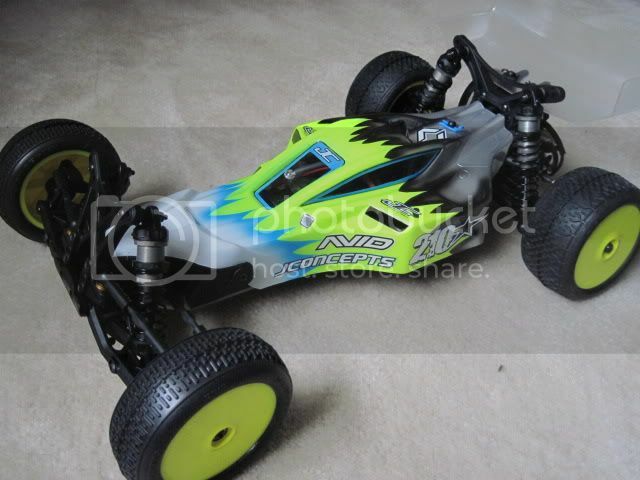 Also where should i start gearing on this car if i am running an 8.5 rear motor 3 gear setup? 8.5 87/21 with some timing. But we have a large x huge track. Kindstrom steps up to the plate.... and knocks it out of the park! Believe me, TD is hard at work getting more kits and parts out. If you check their site you'll find that a few new parts are added almost daily. Your patience in waiting for them to get the job done right will pay off in the end, as frustrating as it may be waiting right now. So now I have a few races on the car and I am pretty happy with it as it sits. It handles rough straights way better than pretty much anything out there, hands down. The shocks are awesome, and I must be a top notch diff builder after reading all the problems people are having building it, because I have had zero issues from day one and I rushed to build mine in a hotel room at 11pm before race day. The usual track I race at is medium to high grip and the right tires are on the car for this track. But now I have a friend who is asking me about trying out the mid motor setup. I never gave it a thought, as most of the mid-motor guys are running on astro/cork/carpet and not dirt. I have thought about trying the 4 gear rear, but would I benefit from going mid motor 3/4? Nobody in the WORLD is running this buggy in stock? The reason why stock use in this buggy might be a bit low right now, is because not everybody knows how to ream a spur gear, and the only spur gear available for the car at the moment is the factory 87 tooth, which will NOT work for stock motors. The car has only been out two weeks. The issue with not having spares isn't unique this buggy. Most new cars have the same problem. Even a US based company like Losi didn't have parts for their 22 for 2 or 3 weeks after the car was released. If you can't ream a spur gear or can't drive in the mod class, and/or can't live without spare parts for a week or two, then right now isn't the time for you to buy this buggy. Guys the car is marketed towards the entire world market, not just the U.S. Understand that around the market "stock" doesn't exist like it does here. If you need a smaller spur gear reaming out a b4 gear only takes a few minutes at best, it works fine. Wheels from companies like DE are in stock at Amain Hobies and elsewhere. I've been running the Dex410 rear "pin" style wheels on mine. All that you need is the spacer and cone washer from it. This allows you to use B4 wheels also, fyi. This buggy is another game changer. Never before did a 2wd buggy come with droop screws, caster block inserts, rear toe inserts, the list goes on. These have always been option parts in the majority of kits. There is a reason it's out of stock, it's that good and sells that fast. Yup....people want to buy them and none available. Buddy of mine bought another brand instead yesterday.